Let’s make sure it’s right! Eliminate headaches by getting out in front of potential issues your home might have. Wind Mitigation inspections to find the key features that reduce the amount of damage your home may suffer in the event of a hurricane or strong windstorm. What makes us the best choice for your inspection services in the Palm Beaches? We know houses in south Florida have different issues and needs different than the rest of the country …and we address those needs in the way we inspect your house. We are dedicated to delivering exceptional home inspection services in our community and surrounding areas. You can trust us to give you an honest and objective assessment of your current or future home or we’ll buy your home back! Guaranteed. 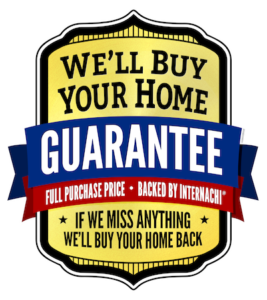 We offer a 90 day guarantee buy back program. Thank you for choosing Wellington Home Inspections of the Palm Beaches!